The focus of my last solo trip to Paris was to update and refresh my personal style and there is no place better in the world to redefine your look than in the fashion capital of the world. Through the years French women have been the trendsetters for classic good looks with a twist of panache. No matter their age, Parisian women exude confidence and relaxed sophistication, something I aspire to always possess. The inspiration for my Paris makeover trip was two fold. First, I had read several magazine articles about how wonderful the House of Dior; Seventy Years of Fashion exhibit at the Louvre was. I hadn't been back to Paris in over 15 years. A split-second thought crossed my mind while viewing some of the exhibition's fashion photos, "Wouldn't it be great to see this historic display of one of the premier international couture houses and fashion brands in person?" The second push that led me to book my Air France ticket to the City of Lights was a series of Youtube videos created by Anne Lipscomb, an inspirational woman from Seattle, who regained her zest for life by visiting Paris after a 20 year debilitating lung disease that had kept her homebound. What happened to her on this Paris trip was transformational. The attitude of Parisian women and their way of life dramatically changed her life for the better. One of the byproducts of her rejuvenation was the creation of her own Youtube channel with personal videos sharing her perspective on the secrets of the French female allure no matter their age. She explains the ethos, mystique and charm of the Parisian Babe and how to capture it to regain your joie de vivre. After watching over 15 of Ms. Lipscomb's wonderful videos I decided I was headed to Paris for my makeover. Yes, my goal was to come back with an updated fashion look, a new hair style, a more modern makeup application technique. and to capture that "je ne sais quoi" attitude Parisian women are known to possess. Bottomline: I wanted to transform myself into an American Babe with a French twist even though I am 67!!!! Being confident and feeling good about the way you look is at the foundation of the Babe philosophy. Age is not a factor!!!! 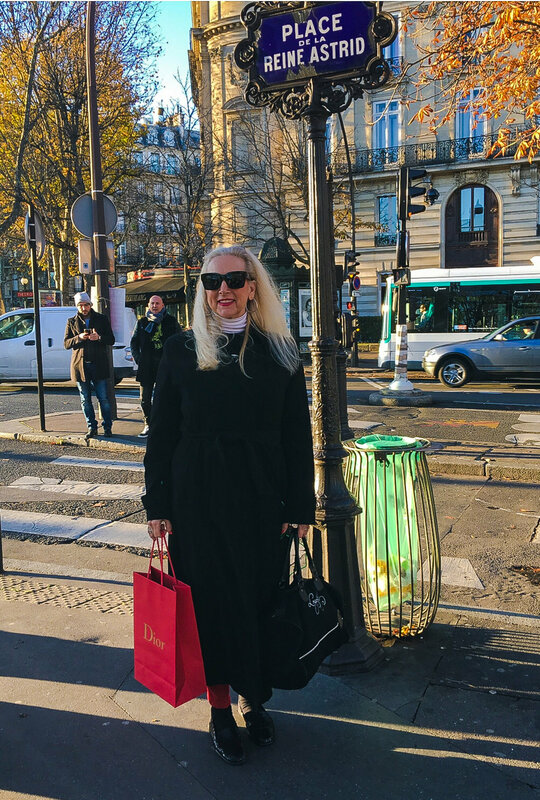 One of the highlights of my weeklong, Parisian solo escape was the memorable day I spent shopping - mostly window shopping - on the Avenue Montaigne, the most fabulous shopping street in Paris. All of the most prestigious designer brands have stores on this seven block street. In addition to the many mind-blogging luxury retail venues, the L'Avenue Restaurant and the Plaza Athenee Hotel are regular haute hangouts for the international rich and famous. 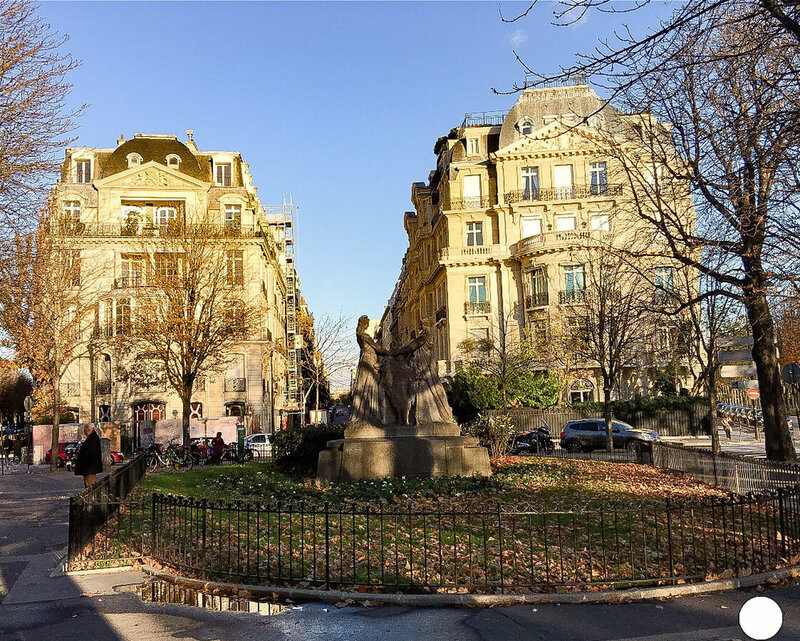 Accordingly, it doesn't get much more rarified in such a small area than on the Avenue Montaigne! Before I highlight my shopping experience on this most exclusive of Parisian streets, I would like to share my take on the posh L'Avenue Restaurant. Located on a rounded corner similar to those found in many of the city's neighborhoods, it’s outside entrance was framed by clipped boxwood filled planters, inviting tables with modern black wrought iron chairs and cream colored cushions that swept around the semi-circular exterior of this ultra toney restaurant. The distinctive moniker, "L'Avenue," beckons one to come in and dine. I must say my heart began to beat a little faster as I approached the restaurant wondering what the interior and the discriminating clientele would look like? Would I be lucky and catch a glimpse of a celebrity? As I was escorted through the elegant, Art Deco inspired restaurant up a gorgeous, spiraling staircase with it's sunflower adorned plaster wall, I couldn't help but notice how outstandingly, good-looking the waite staff was; multi-cultural, well-dressed, drop dead gorgeous! I was seated on a velvet tufted banquette next to the window which gave me a strategic people-watching spot. Stylish, sophisticated solos, couples and groups began to fill every available table many of which had dogs or several designer shopping bags placed on the floor beside them. A low, lively chatter permeated the restaurant. Everyone was conversing with each other and not on their cellphone! In fact, I didn't see ONE person on their Smartphone the entire time I was there. I guess the people who frequent L'Avenue really do come here for camaraderie and to enjoy delicious food. An attractive waitress brought me the interesting menu. I would describe the food offerings as modern French and International fusion cuisine which are made from regionally sourced, organic ingredients. The wine and champagne list selections were predominantly from France and the craft cocktails were equally enticing. Because I didn't have time for a two hour French lunch, I decided on a cucumber martini and a tuna tartare and avocado salad as my lite, mid-day meal which would be just the right amount of delectable food and drink to fuel me up for some serious shopping. Paris has so many great restaurants in which to dine, returning over and over again to a particular one seems almost foolish or sinful but the cuisine and the relaxed, upmarket environment at the L'Avenue causes people to get hooked on eating, drinking and communing here. Consequently, I know I will be back on my next visit to Paris. Enjoy this short video of L'Avenue and get a better understanding for why it is so popular with discerning local and non-local diners. Now for the shopping experience summation; in my opinion this elegant street is the mecca of haute couture and luxury designer fashion. Every top international fashion house has a store located on the Avenue Montaigne with Dior having its flagship and design atelier with this address. 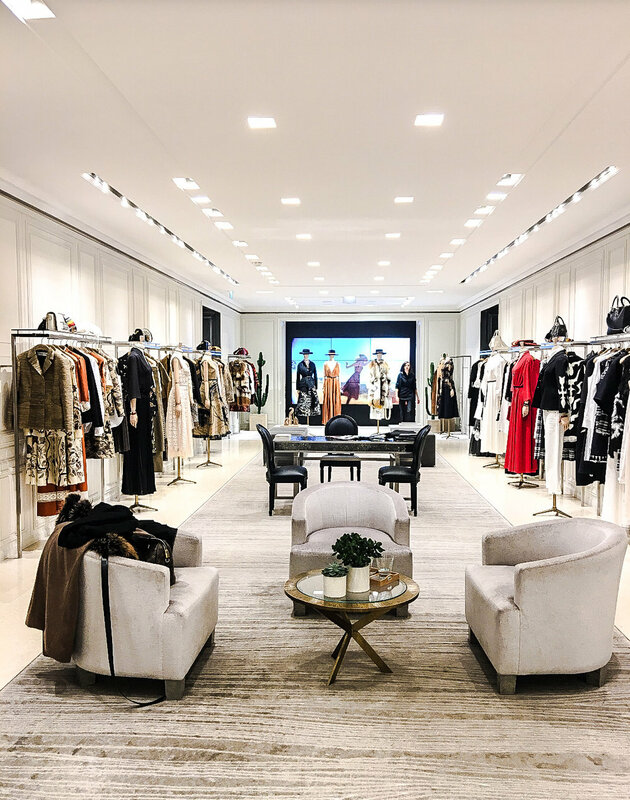 Besides Dior, you will find Chanel, Louis Vuitton, Valentino, Versace, Gucci, Givenchy, Chloe, Fendi, Escada, YSL, Jimmy Choo, Prada and Ferragomo to peruse. I can only imagine how many millions of dollars of merchandise is for sale on this seven plus block street!! I probably should say billions instead of millions of dollars of retail therapy is offered here. Before I set out on my trip to Paris, I decided my big purchase for this trip would be a designer bag. Basically, this item would be my memento. Some Laduree macaroons for my daughter and a bottle of excellent French Bordeaux wine for my husband that would be it for my tangible expenditures. I am a self-confessed shopaholic. In a city like Paris, especially shopping on the Avenue Montaigne, the temptations could easily cause me to max out my credit cards. Be forewarned, its best to set a limit to your spending before you step foot into the cab headed to this fabled street! 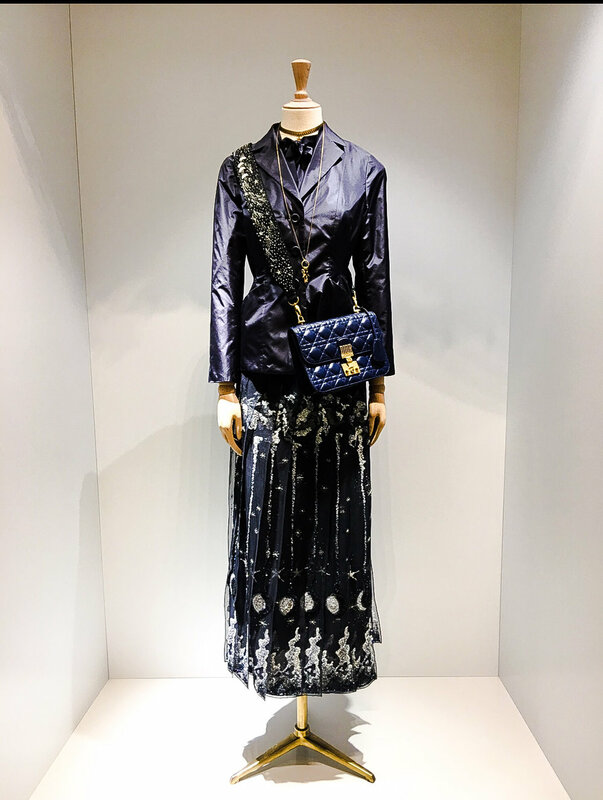 For this blog I will highlight Dior and Louis Vuittton, the two stores I spent the most time in each being ultra exclusive carrying some merchandise that can only be seen and purchased at these locations. Since Dior was across the street from L'Avenue, this was my first stop. Because I was visiting Paris in late November which is at the beginning of the Holiday season, Dior already had some of its outdoor, seasonal decorations displayed. A huge, rising hot air balloon of mini lights graced the outside of its building. Oh, So French!! I was greeted at the entrance by a smiling doorman which I found to be a nice touch of exclusivity. Immediately, I was mesmerized by the wide array of Dior's latest purse collection, the Tarot Card series. Each bag was a work of art that anyone would appreciate even if they were not into the Occult which is a trendy fashion theme at the moment. I loved every bag creation but the Occult is not my thing. Hence, I wasn't interested in this newest series of Dior purses. Before I go any further I need to share my strong admiration for Dior's newest Creative Director, Maria Grazia Chuiri. I think she is fabulously talented. Her modern fashion creations, whether its clothes, bags or accessories, are divine. Madame Chuiri has a very special way of combining a casual and a dressy look that is effortless but powerfully elegant. I particularly love her use of blue-black as the base color in many of her ensembles. Most people believe black is traditionally, the most elegant color used in high fashion but the rich blue-black being shown in Dior's current line is, in my opinion, to die for and equally elegant. 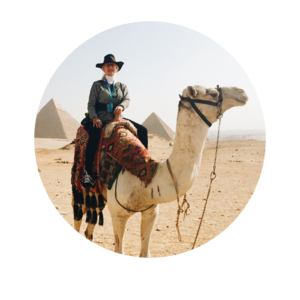 If you love fashion, Google Madame Chuiri and learn about her life, her career and her fashion philosophy. She is taking Dior to the next level! From the purse, bag and accessories departments I wandered into several rooms where MGC’s divine clothes collections were displayed. Casual wear, evening creations and haute couture were all stunningly gorgeous. Leading me to dream about what it would like to be wealthy enough to wear these coveted creations and what type of lifestyle would someone really have to have to comfortably afford and sport these clothes daily. For a shopaholic even fantasy can be fun. Next, I mosied into the shoe department, my true weakness. It is said you are either a shoe or a bag woman. I'm the shoe woman! Dior has always been a brand that makes a strong feminine statement which has been beautifully expressed in its many shoe collections over the years. I loved the blue-black heels and flats with their monogramed, beige grow grain bow ribbon strap. I almost sat down to try a pair or two on but I restrained myself largely because it wasn't a purse! Anyone who loves designer shoes should consider some of the foot ware editions in the current Dior offerings. Baby Dior was the next department. Since I have no grandchildren only a granddog, I quickly moved through this area but I would like to point out this is the only Dior store that carries Baby Dior. So you must come to Paris and to the Avenue Montaigne store to see what ultra chic, French baby clothes are like. One of the departments that was a bit of a shock was the housewares section. I had no idea Dior designed china, crystal and other entertaining pieces. I lingered in this area for a while trying to take it all in. Expensive, exclusive, modern and refined is how I would describe all of the offerings found here. The last two areas I spent some time in were the perfume department and the makeup area. Dior is femininity at its finest. One of the interesting things you can do in these departments is you can get a free makeup consultation, as well as, perfume tutorial in these sections. Dior has a way with lipstick and fingernail polish colors that really can not be copied. The richness and the quality of their cosmetics are unbeatable and their perfumes exude allure and sexiness. If you want to feel like a powerful feline adorn yourself with Dior!!!! My visit to Louis Vuitton was the second luxury designer store I visited on that memorable day along the Ave Montaigne. Like Dior, when most women think of French luxury brands, they think of Louis Vuitton, especially for its bags, shoes, accessories and luggage. Being high-end and highly coveted, an LV item is many times the first expensive purse many women buy for themselves. During its several hundred year history, Louis Vuitton has been the luxury brand of choice for women all over the world. The current First Lady of France, Bridgette Macron, routinely sports Louis Vuitton fashion creations and accessories. This demonstrative fashion statement by the French First Lady should tell you the French love Louis Vuitton. One of the reasons LV has maintained its top status in the bags, shoes and accessories categories is it keeps its classics available and LV is continuously, creating new classics. In addition, it doesn't make too many of one item. So many times you have to wait years or be at the right LV store to buy that purse or those shoes that you really want. This exclusivity quotient is part of the mystique of the Louis Vuitton brand. With that said if you want to purchase the latest and maybe some of the most coveted items, you must come to Paris and shop in the Avenue Montaigne location or the Louis Vuitton flagship store on the Champs Elysee. There is, also, a location on the Left Bank that has an excellent selection of goods. Once again, as I entered the LV store I was welcome by a greeter, this time an elegantly dressed woman. She was warm and friendly as she explained to me the layout of the store. She shared this store was highlighting the new LV fragrances that you couldn't get in most other locations. I love perfume and thus, I asked her to show me around the perfume department and let me sample all of the new editions. All of the scents were lovely but nothing drove me wild. I did share I was interested in purchasing a purse. Her we go!! The greeter introduced me to a purse sales person and she led me to the purse showroom. Passing by an hanging egg basket chair, I asked her to tell me who the artist of the chair was. She explained it was the Campana Brothers, two creative talents working with LV to develop contemporary, foldable furniture and travel accessories as part of the LV Nomades Collection. Likewise, we next walked by a giant, gold rabbit, a signature piece by Jeff Koons, currently the most expensive contemporary artist in the world. In fact she continued that Koons had recently collaborated with the luxury brand to create the Masters series of bags, backpacks, clutches, wallets and scraves. Hum, I thought; I would like to see these purses. Maybe I would find my "Paris Purse" from this collection. I asked the salesman to show me what was available. At first nothing caught my eye and honestly, I was unsure if I liked the design concept of the Masters series. Jeff Koons' inspiration for these editions was to create a collection of classic shaped Louis Vuitton bags such as the Neverfull, the Speedy, the Keepall and the backpack with famous paintings by his favorite famous artists depicted on them. Some of the artists he used for the Masters series were DiVinci, Monet, Turner, Van Gogh, Rubens, Fragonard, Manet, Poussin, Titan and Boucher. His design goal was to share famous classical paintings that he found inspirational with the modern world through fashion. Connecting art and fashion to express the joy of humanism was Koons' focus of this collaboration with Louis Vuitton. I slowly viewed each bag painting done by all of the artists and recognized many of the renowned works of art. The Monet and the Fragonard bags were appealing but not compelling enough to make me want to spend several thousand dollars. But as fate would have it just as I was about to enter another more traditional LV bag section, I spotted the Boucher grouping. Immediately, I was drawn to this series. Besides being a beautiful depiction of a young, seductive woman lying on a chaise lounge, the artist was Francois Boucher, a French family name in my genealogical tree. I know this might sound a little trite and maybe a bit narcissistic but the Boucher name did connect me instantly to the bags. Consequently, I asked the salesperson to show me the Speedy version. The colors on the purse were classic, French feminine muted beiges, browns, peaches and rose with medium blue accents. In addition, the handles and trim were in a coral, one of my favorite colors. He retrieved the bag from the shelf display for my inspection. My heart was beginning to beat a little faster. He explained this Speedy's unique features such as the Koons Rabbit hanging jewelry fob plus his logo and signature on the outside of the bag, as well as, information about the painting, The Reclining Girl, and the artist's photo with a short bio on the inside of the bag. These touches were to exude the combination of the old and new artists' ethos. I began to realize how unique the inspiration for this Louis Vuitton series was. Yes? No? Yes? No? Yes! As with all of this brand's bags the leather was luscious, the craftsmanship was the best and the look was distinctive. I took this special purse from the counter and checked out in the mirror how I looked carrying it. Did I really love it? Was it me? Would I enjoy this unique purse once I got home? Yes, I did love it and it spoke to me! One of the bag's features, I especially liked, was Boucher's name adorned on the outside of the bag in gold brass being highly visible, as well, as the LV flower accented in the same gold brass on the sides that were in the gorgeous coral color. I was hooked. I asked the price. After the VAT refund, it came to $2,350. At least $500 cheaper than if I would purchase the Boucher bag in the US. Before I pulled out my credit card, the salesperson shared I was lucky to be in the Avenue Montaigne location that day because Louis Vuitton only carried the Masters series in select stores throughout the world and the company was making a limited amount of these bags. One of the goals of the Masters Collection is to make the its items collectors items in the future. In addition he said some women were displaying their bag as works of art on book shelves in their homes instead of putting them in the closet when not using them. I thought what a cool idea! I could do likewise and place this special purse in my living room book shelf among some of my other unique travel treasures; what a conversation piece! While I was filing out my VAT required forms in true French hospitality form, I was offered a glass of champagne to celebrate my purchase. Accordingly, I must share all of the sales personnel in the shops along the Ave Montaigne have impeccable manners, are not pushy, tend to be comfortably engaging and everyone of them have highly trained people skills which makes the shopping experience in this area both pleasurable and memorable. Because my beautifully packaged bag was so large the sales staff offered to deliver it to my hotel which I obliged. Now that’s VIP service! Before I left this hallowed store I perused a few other its departments, specifically, the accessories and the shoe sections. Being the shoe fanatic that I am, I saw a few pairs that caught my eye, especially, a pair of loafers in the standard LV monogramed, brown print with black patent leather tassels and gold accents for $600. Loved them but restrained myself from asking to try them on. I knew I could readily get them at home. Phew, dogged a shoe fetish bullet! I left Louis Vuitton lighthearted. This is Paris! I continued down Ave Montaigne window shopping and studying all of the latest fashion creations of the various other boutiques and stores. Likewise, I went into Valentino, one of my all time favorite luxury brands, Escada, YSL, Givenchy and Gucci. While I saw some fabulous other fashion creations, I really wasn't tempted to buy anything else. The Boucher purse had satisfied my shopping appetite. I was so elated with this unique bag because its theme was feminine allure and I knew I had purchased something special accomplishing my goals of enhancing my Babe factor and acquiring the perfect Paris memento. My last stop on the Ave Montaigne was to take a my photo at Place de la Reine Astrid at the far end of the street which I do every time I come to Paris. This charming small square is, likewise, one of my favorite spots in the city because it is dedicated to Queen Astrid, the beloved Belgian queen that died unexpectedly in an untimely car accident. I rarely see my name anywhere in the world when traveling and on top of this, I have a special affinity with this royal because I was named after her! A perfect ending to a wonderful day shopping solo in Paris.